Preheat oven to 400 F (200 C). In a bowl, combine breadcrumbs, herbs, Parmesan, and melted butter to make the breadcrumbs stick together. Season with salt and pepper. 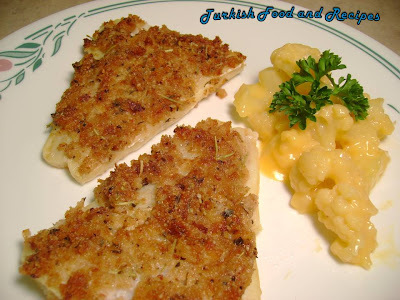 Cover each fillet with ¼ of the breadcrumb mixture, and pat down firmly on fillet. Place fillets in a greased baking dish. Bake for 20-30 minutes or until the fish is milky white and flaky. Serve immediately. Firini 200 C (400 F)’ye isitin. Bir kasede, galeta unu, otlar, Parmesan peyniri ve erimis tereyagini karistirin. Tuz ve karabiberi ilave edin. Her filetoyu karisimin ¼’u ile kaplayin ve fazlaliklari hafifce silkeleyin. Filetolari yaglanmis bir firin tepsisine dizin. Baliklar sut beyazi gibi olana dek yaklasik 20-30 dakika pisirin. Sicakken servis yapin.